Dallas-Fort Worth's local Fox News affiliate is reporting that Eric Casebolt, the McKinney police officer—who was captured on video cussing at Black teenagers, pushing 15-year-old Dajerria Becton's face into the ground while kneeling on her back, and pulling a gun on a group of teens who attempted to come to her aid—has resigned from the McKinney Police Department. 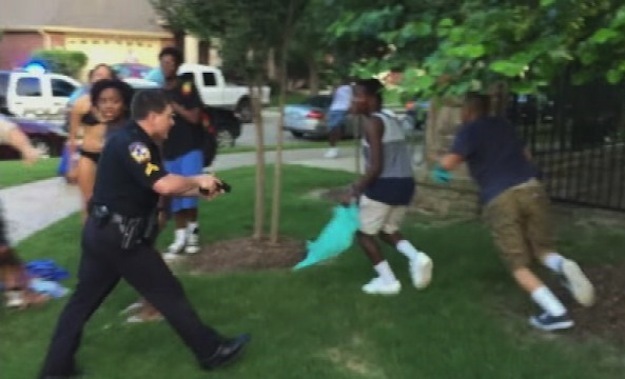 The now viral video showed Casebolt using extreme force against unarmed Black teenagers in swimsuits, when police were called for a disturbance at a community pool in an affluent McKinney neighborhood. Fox News 4 reports that Casebolt's lawyer announced the officer's resignation. For more information, visit the Fox 4 News website. Michelle Denise Jackson is Senior Editor at For Harriet.